When Georgia’s US Senator Richard B. Russell died January 21, 1971, the scramble began immediately to find a worthy successor. A number of political luminaries thought themselves imminently qualified, among them three former governors, a former congressman, and the state’s current treasurer. All would be competing against the appointed senator, David Gambrell in the Democratic primary. The winner would face US Representative Fletcher Thompson in the general election. Thompson promised to tie any Democrat to one of the most unpopular political figures in America, George McGovern. The 1972 race definitely was not for the timid or faint hearted. Outside of Houston County, few people knew Sam Nunn’s name. His closest friends thought he was crazy to consider mounting a candidacy for the US Senate, and told him so. His revered grand-uncle Carl Vinson, who served fifty years in Congress, was among them. Nunn, after all, was only in his second two-year term as a state representative and had just turned thirty-three years of age. On the day Nunn announced his intention to enter the Senate race, McElroy sat down with him to discuss next steps. Nunn pulled out a small gray file box, and shook it. “These are the people I know in the state of Georgia--all of them.” The primary was nineteen weeks away. 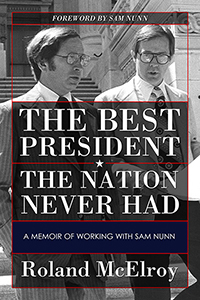 This book chronicles the journey McElroy took with Sam Nunn as he presented a message of common sense conservatism to the voters of Georgia in 1972. Nunn’s principled approach to making government work through cooperation and compromise, and his demonstrated mastery of complex issues, placed him among a rare few considered every four years for the highest office in the land.